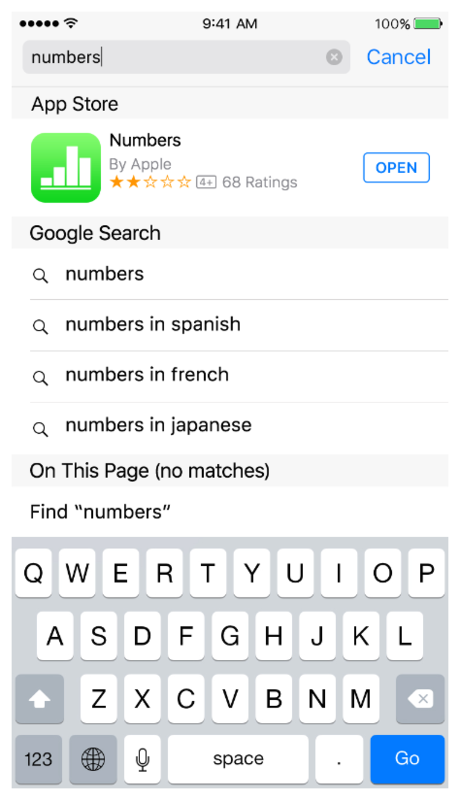 Search in iOS 9 and later gives people great ways to access information inside of your app, even when it isn’t installed. When you make your content searchable, users can access activities and content deep within your app through Spotlight and Safari search results, Handoff, Siri Suggestions, and Reminders. Making your content searchable helps you enhance the user experience of your app and improve its discoverability. App search is easy for you to adopt and customize. You don’t need any prior experience with implementing search, and you control what content gets indexed, which information to show in search results, and where the user goes after tapping a result related to your content. Privacy is a fundamental feature of search in iOS. To give users the best search experience while protecting their private data, there are two indexes that can store searchable items related to your content. You use the various search-related APIs to specify the appropriate index for each item, so it’s important to understand how each index works. To give users the best search experience and increase engagement with your app, you use a combination of different APIs and technologies. Before you begin, evaluate your content to determine where content is stored and who should be able to access information about it. Based on your investigation, choose the APIs and technologies you should adopt. For some examples of adopting search in different types of apps, see Example Implementations. iOS includes several APIs that help you make your content available in the appropriate index. Methods and properties in the NSUserActivity class help you index items as users perform activities in your app, such as visiting a navigation point or creating and viewing content. The Core Spotlight framework provides APIs that help you add app-specific content to the on-device index and enable deep links into your app. Web markup lets you make your related web content searchable and helps you enrich the user’s search experience. Although app search is available in iOS 9 and later, the search functionality of NSUserActivity and Core Spotlight is not supported on iPhone 4s, iPad 2, iPad (3rd generation), iPad mini, and iPod touch (5th generation). It’s recommended that all apps use NSUserActivity and that they support Handoff. Using the search-related properties of NSUserActivity is the best way to show users the information they care about and to improve the ranking of your search results. As users perform activities in your app, you use NSUserActivity to add the item to the on-device index. By default, an item represented by an NSUserActivity object is private, which means that it is added to the on-device index. If your content includes activities that all users can view, you identify them as eligible for public indexing. Learn more about using NSUserActivity in Index Activities and Navigation Points. If your app handles persistent user data, such as documents, photos, and other types of content created by or on behalf of users, use the Core Spotlight APIs to index the content. Unlike NSUserActivity, Core Spotlight does not require users to visit the content in order to index it. In addition, you can use CoreSpotlight APIs to index content at any point, such as when the app loads. Note that Core Spotlight helps you make items searchable in the private on-device index; you don’t use Core Spotlight APIs to make items publicly searchable. Learn more about using Core Spotlight APIs in Index App Content. If your app hosts some or all of its content on a website, use web markup to let Apple’s web crawler (called Applebot) index your content in Apple’s server-side index and make it available to all iOS users in Spotlight and Safari search results. Learn more about using web markup to make your web content searchable in Mark Up Web Content. Note that search results generated by web markup are shown in countries that are supported by Spotlight Suggestions. In addition to using the APIs of NSUserActivity and Core Spotlight and adding web markup, there are three key technologies you should use to give users the best experience. Universal links. Use universal links to replace custom URL schemes with standard HTTP or HTTPS links. Universal links work for all users: If users have your app installed, the link takes them directly into your app; if they don’t have your app installed, the link opens your website in Safari. To learn how to use universal links, see Support Universal Links. Smart App Banners. When users visit your website in Safari, a Smart App Banner lets them open your app (if it’s installed) or get the opportunity to download your app (if it’s not installed). To learn more about Smart App Banners, see Promoting Apps with Smart App Banners in Safari Web Content Guide. Handoff. Handoff lets users continue an activity from one device to another. For example, when browsing a website on their Mac, they can jump straight to your native app on their iPad. 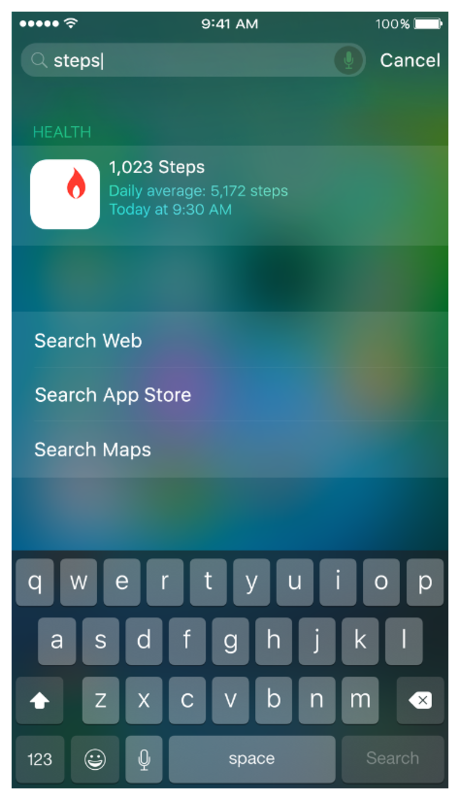 In iOS 9 and later, Handoff includes specific support for app search. To learn more about supporting Handoff, see Handoff Programming Guide. Adopting the search-related APIs appropriately can improve the relevancy and ranking of the search results related to your content. To give users the best search experience, the system measures how often users interact with app content and with Spotlight and Safari results. Because iOS measures the level of user engagement with search results, items that users don’t find useful are quickly identified and can eventually stop showing up in results. Create an app with compelling content. Improve the relevance of your search results by adopting the search-related APIs just described. As much as possible, index only the items that users are most likely to search for. Keep the indexes up to date by removing and updating items when necessary. Encourage users to engage with an indexed item by providing relevant, rich information about it. Minimize the time between tapping on a search result and viewing the content in your app. To learn about ways to improve the user’s search experience, see Combine APIs to Increase Coverage and Improve the Ranking of Your Results.